The seventh entry in the No.1 Ladies' Detective Agency series (after 2005's In the Company of Cheerful Ladies) reaffirms Smith's considerable gifts as a writer. His familiar characters offer further facets of their personalities, and their gentle, tolerant approach to life remains a refreshing contrast to most fictional figures, let alone those populating most mysteries. The author's love for his creations and for his Botswana setting are evident on every page. 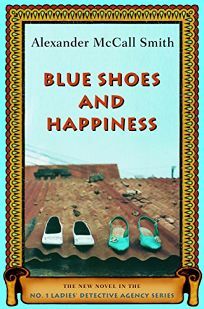 While the plot will be of secondary importance to fans of Precious Ramotswe, the ""traditionally-built,"" self-taught private detective, and her assistant, Grace Makutsi, Smith presents them with several mysteries, including the search for the identity of a blackmailer and the source of malaise at a nearby game reserve. Ramotswe's intuition and understanding enable her to find the truth, while dispensing justice according to her own personal dictates. Even newcomers will be charmed by this wonderful novel, with its skillful blend of humor and pathos, and will doubtless rush to catch up with the earlier books.